The William McKinley administration opened the 20th Century by winning re-election to office in November, 1900 by a comfortable margin defeating Democrat William Jennings Bryant a second time. In September of the following year, 1901, McKinley was assassinated by US-born anarchist Leon Czolgosz. He was succeeded in office by Teddy Roosevelt and the blooming of the Progressive era in US power politics. 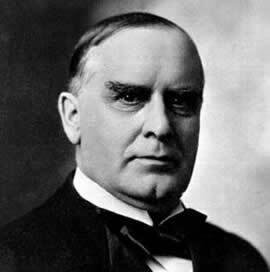 McKinley was an unabashed supporter of the gold-standard. Had the bellicose Bryant instead been elected, with his pledge never to be “crucified on a cross of gold”, the age of endless invented money for the power elite would have begun even sooner in US history. McKinley’s preservation of the gold-standard must be tempered though by his staunch support of high tariffs. However, it was McKinley’s military takedown of the Spanish empire in 1898 for little good reason that first embarked the United States on the perilous road to world empire, something that is just now reaching its predictable end stage. That terrible distinction in US history for McKinley eliminates any legitimate claim his administration advanced economic or personal freedom overall. In August, 1923 a second 20th Century US President suddenly died in office, Warren G. Harding, head of a perpetually scandal-ridden administration. It was rumored by Harding’s mistress that Harding’s wife had poisoned him in the White House. Harding’s successor Vice-President, Calvin Coolidge, a staunch family man raised on a Vermont farm, was the last small government US president to hold office. Silent Cal was known for his telepathic connection to middle class values of hard work, self-reliance and family independence. Coolidge easily won his own election victory in 1924. Every Coolidge federal budget reduced federal spending, the last times in US history with the exception of the grand feat of Harry Truman. 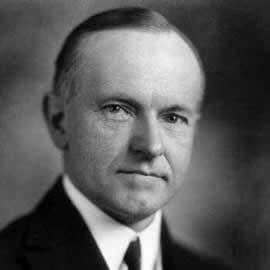 The federal income tax was tamed by Coolidge to the point only the top 2% of earners remained in its snare. Coolidge vetoed massive farm subsidies approved by Congress saying “farmers have never made much money and it is doubtful whether much can be done about it”. Coolidge reduced the national debt by over 25% with his steady surplus budgets. The soft money policies at the Federal Reserve blowing its first stock market bubble were hardened somewhat under Coolidge only to run amok thereafter. It can be easily concluded though Coolidge deferred too much to Federal Reserve Board “independence” and to the money policies of his powerful Treasury Secretary, Andrew Mellon, whom he came into office with. Also a believer in civil liberties for all Americans and the architect of a humbler US foreign policy there is little on the scale of liberty to counterbalance Coolidge’s contributions to the cause of economic freedom and to liberty overall. Coolidge should not be faulted for not taming the Federal Reserve too along with the income tax and the national debt. It is appropriate to also say Coolidge’s economic policies did not continue after his term in office having not been the subject of much enduring legislation. A small federal government and a laizze-faire culture were the realities of Coolidge’s time, the default setting in liberty for America returning to its proper place. Thinking back with hindsight, building some legal barriers to advancing government would have been the best thing Coolidge could have done during his leadership of liberty’s 1920’s renaissance. Harry Truman was a Rooseveltian Democrat on most economic matters. Truman’s Fair Deal tried to expand the New Deal into providing national health care and poverty entitlements, civil liberties gains and more. The Fair Deal, for the most part, was never enacted. Truman somehow navigated as President one of the worst periods of labor unrest ever amid the chaotic WWII de-mobilization of military forces and industry, national strikes and public union strikes. Both unions and management ended up hating Truman for it. The Republicans seized control of Congress under Truman in the 1946 election, the first time since Hoover’s day. But Harry Truman of the Kansas prairie must have been an Austrian economist in his heart. It was Harry Truman who finally ended the legacy of the Great Depression with some of the boldest acts of political courage in the 20th Century. In fiscal year 1944, Truman’s first year in office, the WWII federal budget consumed 44% of the national gross domestic product. In fiscal year 1948, the year of Truman’s unexpected re-election, the federal budget had shrunk to less than 9% of the national GDP, a near 80% reduction in the size of the federal government over four years, far smaller now than with the Roosevelt prewar budgets. Such an astonishing drop in government spending has seldom been seen anywhere, even in post-revolutionary times, let alone by a conquering nation in the wake of world victory. Somehow, Truman had dispersed the fantasy that government spending is good for an economy, in practice if not in principle. All of the Keynesian soothsayers and money grabbers and power mongers were stiffed by the Truman White House after the fall of Germany and Japan, even as the economy crashed into a huge recession in 1946. But then the US economy boomed for more than a decade as the dividends of greater liberty and small government sunk into the US economic engine again. Truman’s post-war budgets were the single greatest achievements for US economic freedom in the 20th Century. Those budgets paved the way for the 1950s American middle-class boom that is Truman’s seldom recognized legacy as President. When Jimmy Carter took office in January, 1977 the US economy was in the throes of stagflation: high inflation and slow growth bred by the policies of the Johnson, Nixon and Ford years. Just as today in mega-form, the core of the economic malaise was the boom-bust cycle of central banking monetary malpractice. The Fed Chairman appointed by Nixon in 1970, Arthur Burns, was a notorious money-printer. It was also Burn’s Fed that loaded the Watergate burglars with sequentially numbered $100 bills. By 1977 the interest rate on the 3-year Treasury bond had been suppressed by Federal Reserve hot money to below 7%, a rate next to negative territory given the existing high rate of inflation that was growing steadily higher. In 1977 all interstate commerce was being strangled by the rules and regulations and handouts of the Interstate Commerce Commission first established in 1887. All railroad, trucking, bus and airline routes and fares were under strict federal crony control for the most part. The ICC had become the template for many federal regulatory agencies from the SEC to the FCC to the NLRB. The US telephone industry in 1977 was AT&T, period, a complete monopoly. All American homes desiring phone service at the time rented near identical plug-in phones from AT&T paying local and long-distance fees along the way. Aside from the 1960s dial-tone innovation, little had changed in the industry since AT&T’s origin as the Bell Telephone Company in the 1880s. In 1977 the OPEC oil cartel was inflicting its second round of steep price hikes on US consumers. The US was importing from overseas 46% of the nation’s annual oil consumption. The domestic oil industry was heavily regulated and subject to price controls. So, like fellow Democrats Barack Obama and FDR, Jimmy Carter came into office amid dire economic circumstances and, like Obama, an overregulated economy too. Carter’s solutions though could not have been more different. In his deep recession Carter offered no bailouts, no new entitlements, no stimulus plans, indeed next to nothing to help Wall Street. The national debt barely budged under Carter, smaller actually in relative terms by the end of his term in office. During the last year of a Jimmy Carter budget, 1981, in the midst of a quite deep, quite necessary business recession, the official inflation rate was near 12% and beginning its brisk fall to normality without Federal Reserve hot money in play. The interest rate offered for a 3-year treasury bond was pushing 15%, well into positive interest rates for savers. Credit card interest prime rates rose to 18%. The national debt stood at $930b, only 33% of national GDP at the time, less than 1/17th of the present national debt. By 1981 the percentage of oil imported into the US had plunged to 30% of total consumption. In the post-Carter years the national recession bottomed out thereby wringing out the malinvestment built up over twenty years. The cleansed economy rose back with a vengeance for six years under Ronald Reagan, unfortunately fueled in large part by historic federal deficit spending and new Federal Reserve hot money, the twin poisons destroying the American middle class right up until today’s time. In short, Carter and his Fed Chairman appointee, Paul Volker, finally killed the beast of chronic stagflation with the only remedy that could actually work: a return to free market principles of capital formation, especially the ending of the manipulation of interest rates by the Federal Reserve. This took extraordinary political courage. The highway robbery Bush-Obama –Bernanke federal bailout schemes in response to the 2008 sudden recession stands in the sharpest of contrasts with the Carter-Volker policies of 1980. It is the difference between a government restoring a level playing field for the middle class and a government determined to always squeeze the middle class to further empower and secure the insider elite. The main benefits of Carter economic policy though were more thoroughgoing than the 1980s post-recession boom proved to be. The changes Carter’s deregulation brought to transport, to energy and to the telephone industry continue to greatly benefit US consumers and the general economy right through till today. The antitrust suit seeking the breakup of AT&T was filed and then forgotten by the Ford Administration. Jimmy Carter once in office pursued the breakup with vigor. Nonetheless, it took four more years to get AT&T to a trial. The trial began the week before Ronald Reagan was inaugurated as President in 1981. It proved the end of the Ma Bell monopoly. The new free market US phone industry proved a juggernaught for both telecom service and pricing. Phone companies proliferated, national ones and regional ones. Prices plummeted, even ending local and long-distance charges altogether over time. Phones of all conceivable looks and functions enticed the consumers. First, suddenly, the phone was able to wander some distance away from its battery that was connected to the phone line in the wall. Then the phone became unhooked to exterior lines altogether passing solely through the air instead. Then the phone came online. Much, if not most, of this innovation in telecoms is directly due to the magic of a free market, first in the US and now globally. In the twenty years after Jimmy Carter left office the US telecom industry made far more progress than it had made in the first century following the telephone’s invention. Jimmy Carter proposed and signed into law a series of regulatory abolitions that transformed the transportation business, from airlines to trucking to railroads. The crony wet blanket that had been covering the US transportation industry for generations, the ICC, was dealt a fatal blow by Jimmy Carter’s enthusiasm for free markets. Like Truman’s return to capitalism thirty years earlier, chaos seemed to be the norm for the transportation industry for a time under Carter and later, especially airlines. Airlines and their unions disappeared like hotcakes while two more grew up in their place. Air routes multiplied while fares often plummeted amid fierce competition. When the big airlines dropped routes from small towns, commuter airlines grew up to serve those customers. With the abolition of the Civil Aeronautics Board by Carter, US air miles flown by the public tripled over twenty year’s time. Richard Nixon’s policy of wage and price controls affected the US petroleum industry as much as any sector of the economy. By 1977 when Carter took office federal interference in the free market was making new oil exploration far sparser despite the expanding need for oil. This enhanced the power of OPEC nations to hike the price of oil almost at will. The first thing Carter’s new Department of Energy accomplished, believe it or not, was the deregulation of the price of petroleum and other energy products, including natural gas and coal. 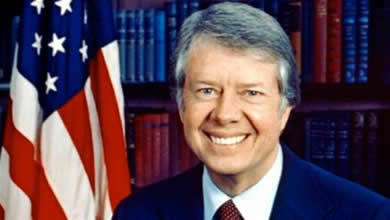 By the time Carter left office energy prices were close to being market-based for the first time in a generation. The next thing Carter’s Energy Department accomplished was a national plan to reduce US oil consumption by voluntary conservation, including the unpopular national 55-MPH speed limit. Carter was vilified by conservatives for turning down the heat in the White House and wearing his best cardigan to stay warm. The Reagan administration reversed many of the Carter conservation programs, but it only delayed for a decade the quite needed changes in US oil consumption methodology. Those changes in the ways power plants, factories, businesses and homes consume energy came to the US instead through the steady pressure of higher OPEC prices for oil. Carter’s wish to enact the best way to reduce the demand for petroleum and coal over time in an orderly way, while spurring alternative energy innovation, a national carbon tax, never came close to passing in Congress though enacted throughout Europe. Nonetheless, US foreign oil imports fell by nearly one-third between 1977 and 1981. Jimmy Carter started no wars, though he was greatly provoked to do so by Iran’s Ayatollah Khomeini. Carter firmly supported civil liberties. He was the patron saint of deregulation across the economy. On the negative side of the liberty scale it was the Carter Administration that created not only the federal Department of Energy, but also the federal Department of Education. The latter department has made no known contributions to greater liberty or to actually educating children. With the thirty year plus age of federal irresponsibility beginning in 1981 just after Carter left office, it can be said with certainty that President Jimmy Carter is the last capitalist serving in the highest office of the United States. Carter may prove to be the last capitalist to ever hold that office. It can easily be contended by those who value liberty that Jimmy Carter, with his transformation of the US economy for the better in several major ways, was also the greatest President of the 20th Century. Just about every American can truly thank Harry Truman and Jimmy Carter for a large share of what is left of their prosperity. Mr. Merrill served in the Navy Judge Advocate General’s Corps and as a Navy Reserve Intelligence Officer.